With our unhealthy lifestyles today, filled with junk food, fast food, all-you-can-eat food and can’t-resist-the-temptation food, we search frantically for the foolproof diet to slash the calories. All you girls know exactly what I’m talking about. But what we fail to realize is the importance of eating healthy and taking preventative measures from sickness and disease. Before we turn to our family physician or Dr. Google for medical advice, why not consult the wise words of the Prophet sallallahu alaihi wasallam revealed from above. Medicine of the Prophet is one book that should be in every Muslim family’s library. Packed with natural remedies and prophetic guidance for ruqyah, everything is supported with authentic ahadith. Ibn Qayyim rahimahullah managed to write an extensive book on human health centuries before microscopes were even invented. The Darussalam publication has been divided into 4 parts which make it a convenient family reference book. The topic of Prophetic medicine is introduced with a detailed section on the several kinds of diseases out there with emphasis on the hadith “For every sickness, there is a cure”. 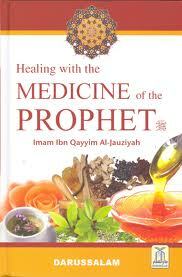 The two main sections of the book are “Using natural medicines prophetic-style” and “Prophetic Ruqyah”. A handy alphabetical index at the end of the book allows you to easily skim through numerous foods and herbs mentioned in Ayat and Ahadith wit their benefits and remedies. From fevers to tonsillitis and even sorcery, the advice of Rasulullah salla Allahu alaihi wasallam for our health and wellbeing will be forever treasured by those who apply it to their fast-paced, fast-food based lifestyles of the 21st century.